Greg Norman a professional golfer has been planning to build a world-class golf course on Caye's Chapel, Belize. Ambergris Caye, Belize, March 5, 2016	(Newswire.com) - Travelers and tourists all over the globe are being frantic in visiting the country of Belize that has been known for having over 450 offshore islands that provide great outdoor activities for the whole family. The place is truly a tourist destination but that is not the reason for its recent popularity. The public is stunned by the news that golf legend Greg Norman is adopting and will be re-designing the Caye Chapel Golf Course as part of their huge proposed development project on the island. Greg Norman a professional golfer and a full-time entrepreneur is a renowned golf player for being the #1 ranked golfer in the Official World Golf Ranking in the 1980’s and 1900’s. Aside from his fame with golf, he is also entitled from having a great reputation in designing numerous golf courses all over the globe. That is just the start, with his enormous talent. He has been planning to build a world-class golf course on Caye’s Chapel that already has an 18-hole golf course. With his undoubtful fame and social status, Belize officials are thrilled as they believe that his project can bring huge benefits to the islands tourism industry. Although Greg Norman’s revelation is still on the move, travelers and tourist should explore the island for a weekend getaway as the whole family can spend some time playing and discovering the beauty of the island. Every time you lose, you think that life's unfair. You think of the bad breaks. But when you're winning and playing well, you still get those bad breaks, only you overcome them. It just depends on how strong your mind is. 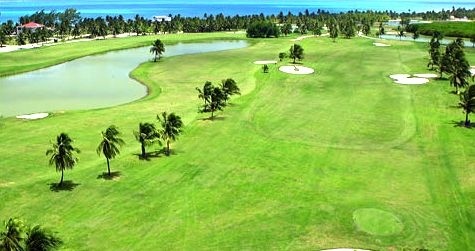 The Caye Chapel Gold Course is composed of great mixtures of both challenge and picturesque, where the course is mostly covered with a spit of sand as they move north and south from the massive clubhouse in between the saltwater pond and swaying palm trees. Every hole on the course generally offers a Caribbean ambiance. With holes positioned near the sea floor, golfers can have a quick swim if they want to. With the course being on an island, they can expect to have the course all to themselves. As they plan for a swim, they should avoid the ponds for they are home to saltwater crocodiles which are indigenous to the Western Caribbean. As the play golf on the island and they choose to stay for another day or two, the island offers a beautiful bench fort villa that can accommodate 4 persons and a marina front casitas for 2 people. Although the villas are built with kitchens, they are no market in Caye Chapel. Guests have to get their meals at the very elegant clubhouse restaurant. As they seek for a fun and exciting nightlife and shopping extravaganza, they should stay as Ambergris Caye which is the busiest tourist island with a 10 minute fly on a plane and a 40- minute ride by boat. From a huge and fabulous golf course, indulge with their great coastal area. For the country is known to have the Second Largest barrier reef in the world. Caye Chapel Island Resort can assist all their guests’ aquatic activities. Aside from that, they can also facilitate some mainland adventure on visiting Mayan ruins and Belize Zoo.